All over the world and all through history, humans have always made tools in order to try to make their work easier. The earliest people made much simpler tools than the ones that you might use today. Still, when archeologists study the places where the earliest humans lived, they find stones that appear to have been used as hammers and scrapers and grinders. Because these earliest people only knew how to make tools out of stone, not metal like so many of the tools we use today, we call this earliest period the “stone age”. Not all their tools were made of stone. People in the stone age also made tools from wood and bone and many other natural materials they found around them. However, stone tools were the strongest tools they had, and they are the easiest for us to find and study since stone is so durable. The very oldest stone tools that we have found were made by early humans around two million years ago. From that time down until about 10,000 years ago stretched the period archeologists call the Paleolithic [pey-lee-uh-lith-ik] or the “old stone age”. During the Paleolithic, people lived as hunters and gatherers, that is, they lived by eating what animals they could kill and what wild fruits, nuts, vegetables and grains they could find. You can imagine, this must have been a lot of work. Imagine if your parents had to find all the food for your family by looking for wild plants and animals. (You might have had to spend a lot of your time helping them prepare meat to cook or gathering nuts and vegetables to eat.) It was very important for Paleolithic people to live in areas where there was plenty of food to be found. If food became scarce, they had to pack up and move to another place in search of food. People learned to make better and better stone tools during the course of the Paleolithic. 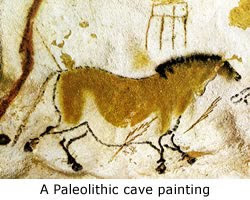 Some people lived in caves, and decorated the walls with pictures of people, animals, hunting, and colorful designs. They also made little sculptures carved from bone, wood or stone. But they always had to keep moving in order to stay where there was plenty of food. Then between 10,000 and 8,000 years ago something changed: people started planting seeds of the grains and vegetables they ate. Instead of having to search for and gather food, they grew crops near their homes. This may seem like a simple idea, but it was a very big change for people to go from searching for all their food to clearing fields and planting crops. It was difficult too. If there was not enough rain, the crops would not grow, and there would be nothing to eat. That is why farming was first invented by people living near big rivers that flooded every year, providing plenty of water for crops. Other early farmers lived in places with mild climates and plenty of rain. The crops these first farmers grew are many of the same ones that farmers grow today: wheat, barley, oats, millet and lentils. People also learned to grow vegetables, and they planted trees and vines, especially olive trees and grape vines. Chances are, you don't live on a farm, and you don't think much about farming, but it's thanks to farmers that today we don't spend all our time looking for food each day. As people got better and better at farming, it became possible for one farmer to grow enough food for several people. This allowed people to gather together in larger and larger cities, and allowed some people spend their time doing other things. They became carpenters, builders, potters and tool makers. While people had lived in much the same way for hundreds of thousands of years when they had to hunt and gather all their food, things began to change much more quickly once people settled in once place and began farming. For this reason, historians and archeologists consider the invention of farming to be the first big change in the history of mankind, and so even though the first farmers still used stone tools and did not know how to get and use metal, we call the time after farming was invented the Neolithic [nee-uh-lith-ik] or the “new stone age”.